David Miller works on a drawing in his workshop in the basement of Whatcom Museum on Tuesday, December 4th. Quetzalcoatlus isn’t Miller’s only painting depicting a dinosaur. In fact, much of his career as a professional artist has been centered around creating scientifically-accurate depictions of prehistoric animals. His interest in painting prehistoric animals goes back to his childhood, he said. When he was younger he used to draw dinosaurs and World War II fighter planes. After high school he attended Montserrat School of Visual Art in Beverly, Massachusetts and the Art Student’s League. His first step into the world of prehistoric painting began after he found an anthology on vertebrate paleontology. The book described the taxonomy of different animals and showed illustrations of their skeletons. Miller said he was interested by the “very strange” prehistoric fish he saw and took a shot at painting them. A lucky phone call led to these paintings being included in a book called Discovering Fossil Fishes published in 1995 by John Maisey. After that, everything else fell into place. Miller said he makes scientific accuracy his primary goal. In this genre of work, it is everything, he said. To illustrate his point, Miller recounted the story of a painting he created for the Florida Museum of Natural History in 2004. The museum had flown him to Florida and made him go snorkeling in the underwater environment he would be painting. Afterwards he spent many hours working with an expert on mollusks to make sure every detail of his painting was correct. In 1992 he moved to Bellingham with his wife. In 1993, Miller started working with the Whatcom Museum after he noticed the Whatcom Children’s Museum was putting on a dinosaur exhibit. He offered to paint a dinosaur for the exhibit. The Museum continued hiring him for projects over the years, including two massive 80-foot murals. One, created in 2001, depicted African, Asian, and American rainforests, and the other, created in 2006, depicted marine and harbor habitats. In 2012 he was hired full-time as the Museum Preparator. 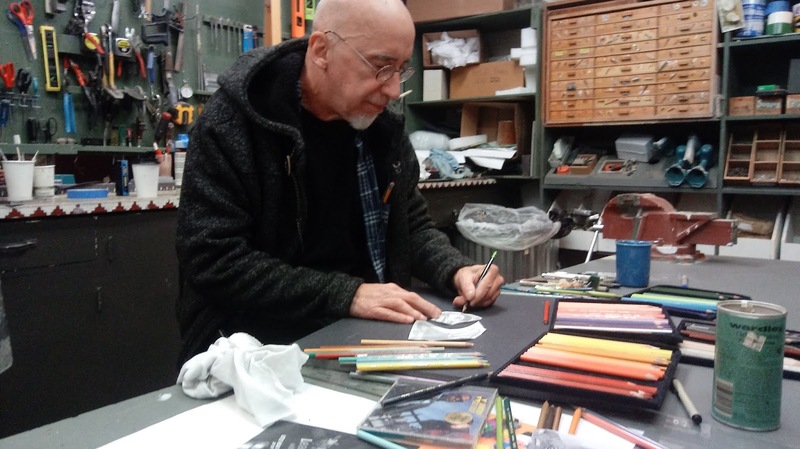 In this position he engages in a wide variety of tasks, from hanging and displaying artwork for exhibitions, to creating object mounts, to painting backgrounds and scenery, to lighting artwork and displays. Miller still spends a considerable amount of his personal time drawing but doesn’t currently do contract work. He said he doesn’t have the time for it. After he finished looking at one of his older paintings, he grabbed another binder from the corner of his desk and cracked it open. This article was originally published on the Whatcom Museum's blog. It can be found here.